Poll managers and candidates are finding the mobile phone an extremely useful device for reaching out to executives, managers, bureaucrats, homemakers and senior citizens and establishing a personal rapport with them. 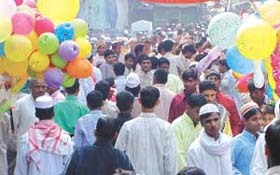 The political parties are making a last-ditch effort to woo the voters ahead of the December 1 Assembly election in NCT of Delhi. Just three days before the campaigning for Delhi Assembly election ends, the Delhi Police claims to have registered 1,000 cases against various candidates for pasting posters on walls and vehicles without the consent of owners. Film star Manisha Koirala’s role as a painting competition judge had her gushing at what she saw. The star was amazed at the “creativity” and the “talent” that “children these days possess”. The North district police, in three different incidents, has apprehended four persons, including two women, and seized 252 bottles of illicit liquor and 32 bottles of country made liquor and a Santro car from their possession. The special police team, Noida, has nabbed five members of the inter-state criminal gang, Sher Banga Jati. They belong to the Bawariya tribe, the police said. Wanted in Delhi, UP, Punjab and Haryana and a number of other states for murder, decoity, loot and other crimes, the gang members had been eluding the police forces of many states for the past 20 years. Nearly all petrol pumps in Faridabad district went on a lightning strike today in protest against the registration of cases against the owners of seven petrol pumps in the town by the district administration on charges of adulteration. After the Prime Minister, the Deputy Prime Minister and a host of senior leaders having donned the ‘canvas-sing’ shoes, it is the turn of Ms Sonia ‘Madam’ Gandhi to grab the microphone. Ms Gandhi is scheduled to address three public meetings in the city tomorrow. Sharing the podium with Madam will be DPCC president Prem Singh and Chief Minister Sheila Dikshit. Shiv Sena, a key NDA ally, today released its manifesto for the Assembly election in NCT of Delhi. 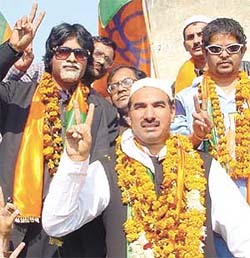 The party promised to rid the Capital of illegal Bangladeshi migrants and introduction of a common civil code for all Delhiites on the pattern of Goa besides the imposition of a blanket ban on cow slaughter. Representatives of various political parties, social and voluntary organisations and trade unions today protested against the release of sub-standard quality of wheat at the fair price shops for distribution among families living below the poverty line in this city and elsewhere in the district. Jathedar Rachpal Singh, president, Shiromani Akali Dal (Master Tara Singh), greeting socialite Nafisa Ali on Id. With a view to selling its products, a Haryana Government undertaking, Hafed, has initiated the process of appointing Hafed franchisees in the villages. According to official sources, the franchisees will work as agents for the sale of fertilisers, pesticides, certified seeds, cattle feed and poultry products, basmati and non-basmati rice, mustard oil and other refined oils. The first day of the seasonal crushing of sugarcane in Ch Devi Lal Cooperative Sugar Mill at Gohana proved to be a day of troubles for the farmers as well as the mill staff due to some technical faults. The Haryana Cooperative Sugar Mills, Rohtak will start its 48th crushing season from tomorrow. The previous crushing season, 2002-03 was started on November 21 last year and the mills had made remarkable impact on all norms of sugar industries as was evident during its 154 days of operation. Twenty-eight families of employees of Panipat railway station under Northern Railway are a harried lot over lack of basic facilities and amenities in the railway colony. The UP Government has sanctioned Rs 50 crore for the construction and maintenance of roads in the state. Each MLA will get Rs 15 lakh for the maintenance of roads in his constituency. Besides, four special projects will be implemented by the UP State Construction Corporation. Approval to this proposal has also been accorded. Mystery shrouds the disappearance of Rs 63,000 from the cash counter of a post office at Gohana town, 35 km from here yesterday. According to a report, the police investigations were still in progress. However, no case has been registered so far. The cashier has alleged that two unidentified youths had taken away this money. Prayas has come up with a novel idea to rehabilitate and help girls rescued from trafficking by the police bounce back to normal life by setting up a food outlet in South Delhi run only by these girls. The local police claim to have busted a gang of thieves and recovered valuables worth several lakhs of rupees, including five cars from them. According to information, the thieves were arrested on Saturday night on the Ugra Kheri Road while replacing the registration number plate of a Balero jeep. GREATER NOIDA: The DTC bus service from Delhi to Greater Noida was warmly greeted by the residents of the area on November 25. The service was flagged off by Brijesh Kumar, Chairman of Noida and Greater Noida authorities from Honda Seal Company at 10 am. 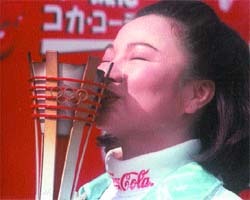 If women are going to be cheered by this, the men are going to be happier. A study conducted by an NGO in collaboration with Delhi University has claimed that men have become more supportive of their families and their attitude towards the community at large too is undergoing a change. 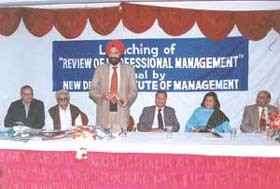 The New Delhi Institute of Management launches a journal titled ‘Review of Professional Management’. The inaugural issue is released by the Chairman of the National Commission for Minorities, Mr Tarlochan Singh. ROHTAK: Students of Maharshi Dayanand University today raised their voice against the social evil of dowry creatively by making eye-catching posters as part of the on-the-spot poster competition organised by the Students’ Welfare Department on the occasion of Anti-Dowry Day today. The Athens 2004 Olympic Torch Relay will pass through New Delhi to set a historic precedent as New Delhi will then join the family of Olympic Games host cities as confirmed stop for the flame during its global journey. Ajit Singh fired the deciding goal in the shoot-out to help Zara beat Aravali 8-7 in the opening match of the Rabo India Maharaja Hari Singh Memorial Cup Polo Tournament at the Jaipur Polo Ground on Wednesday. Saraswati Senior Secondary School, Rohtak went down to Dumdum Kumar Ashutosh Institute, Kolkata (West Bengal) 0-2 in the Subroto Mukherjee Cup Football Tournament at the Ambedkar Stadium on Wednesday. All-round performances by Sahil Arora (66 and 3 for 35) and Sachin Gaurav Rathi (43 and 3 for 39) enabled Hansraj Model School defeat Sarvodaya Bal Vidyalaya by 78 runs to annex the seventh H S Sistani Inter-School Cricket Tournament at the S S Khalsa School ground, Lajpat Nagar. 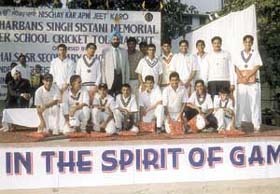 National Commission for Minorities Chairman Tarlochan Singh with the Hansraj Model School cricket team, who annexed the H S Sistani Inter-School Cricket Tournament on Wednesday. NEW DELHI: Air Sahara flew past Delhi Blues with a six-wicket victory in the third C L Gupta Memorial Cricket Tournament for the Prem Lata Trophy at the Mohan Meakin ground and entered the semi-final.